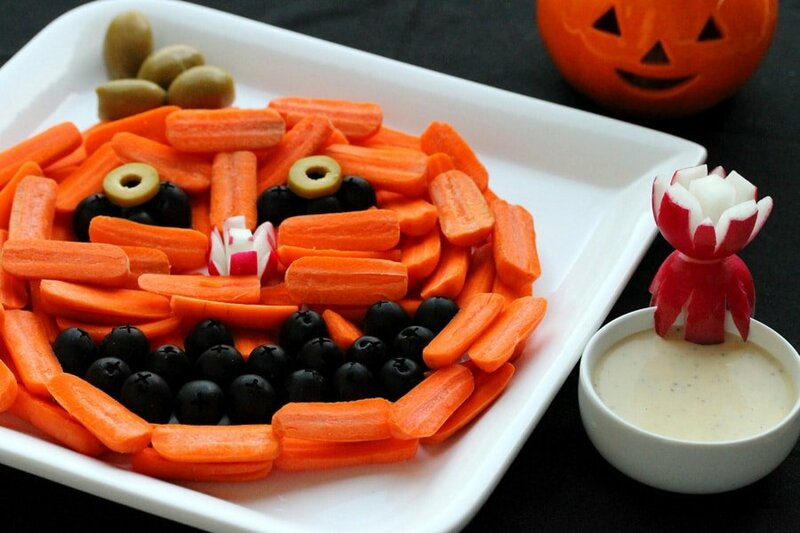 Here’s a fun idea for making a relish tray this Halloween. 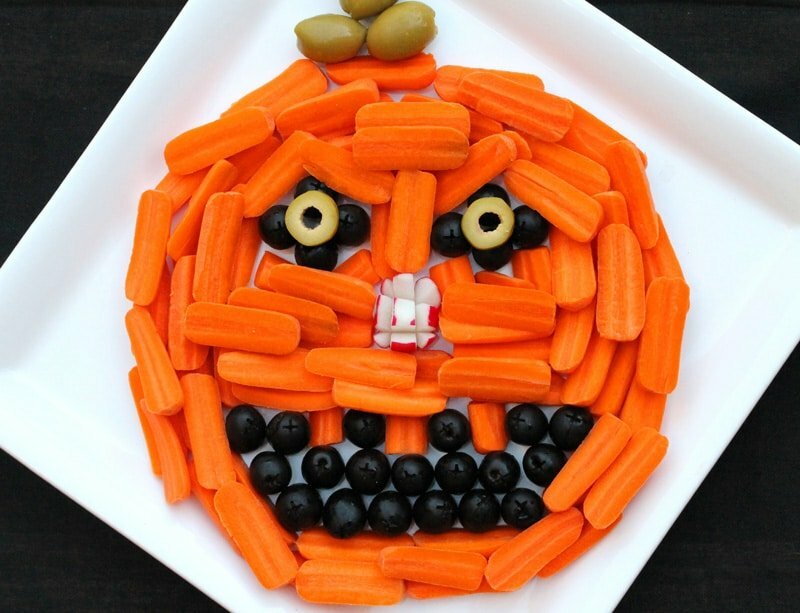 This is so fun for kids to make too! When I think of Halloween I think of the colors orange and black. 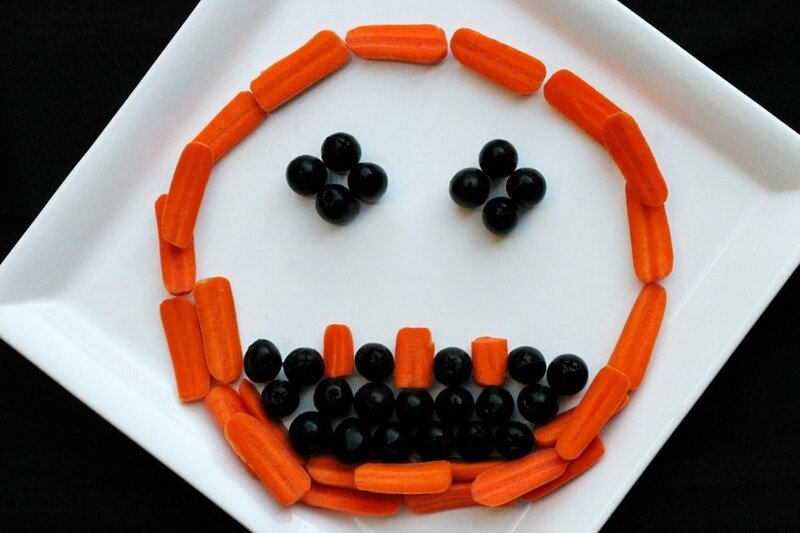 And when I think of foods that are orange and black, carrots and black olives come to my mind. 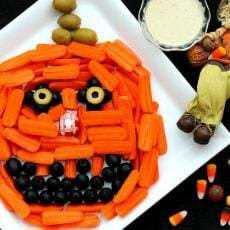 Which then gave me the idea of making this pumpkin head relish tray. I actually made a couple of these relish trays. One of the pumpkins looks a bit happier than the other (however, the happy pumpkin looks like it was up too late the night before….I noticed some bags under its eyes). The unhappy pumpkin looks a bit more scary because it has some carrot eyebrows that look a bit cross. See if you can tell the happy pumpkin from the scary pumpkin! 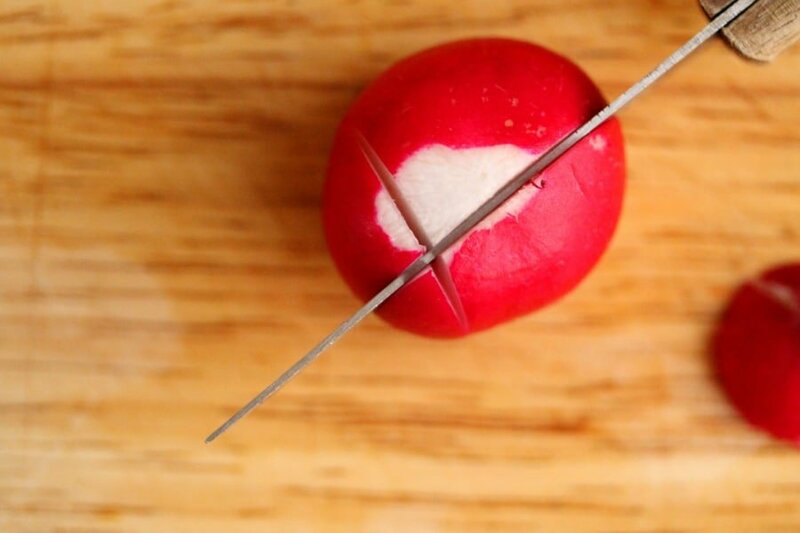 Make a radish rosette by first cutting off the top and the tip of the radish. 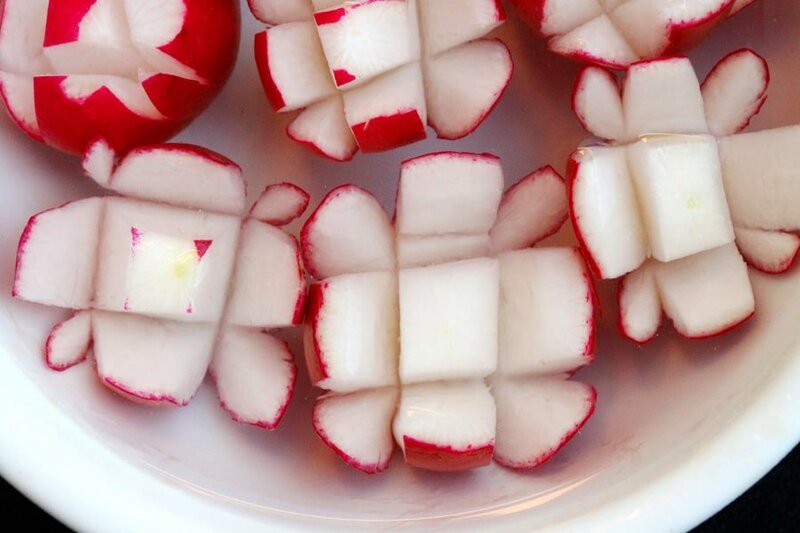 Looking at the radish from top to bottom, imagine that it is a square with 4 sides. 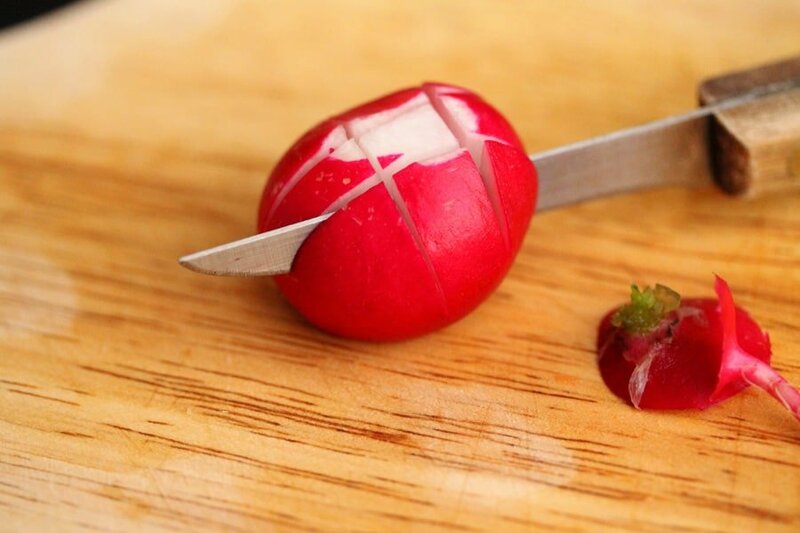 Then with a small knife, make a cut down one side of the radish that is about half way down to the bottom of the radish. 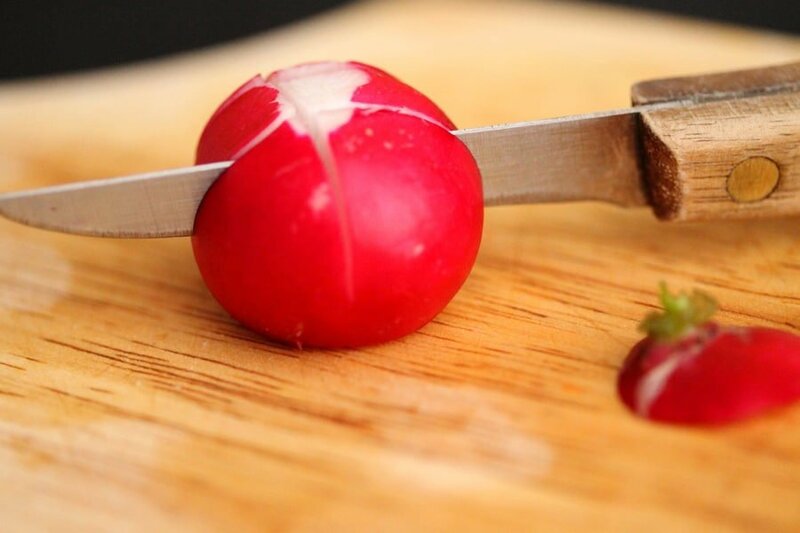 Don’t cut the radish all of the way down. Next, on the other side of the radish make another cut that is about half way down, making sure not to cut the radish all of the way down. Then repeat by making the same type of cuts down the next two sides. Add water and a couple pieces of ice to a small bowl. Add the radish to the bowl. Let sit in the refrigerator for about 20 minutes or until the radish opens up like a flower (I made some extra radishes for the sole purpose of snacking). Cut the carrots in half lengthwise (if you’re cutting the carrots ahead of time put them in a Ziploc bag with some water so they don’t dry out). 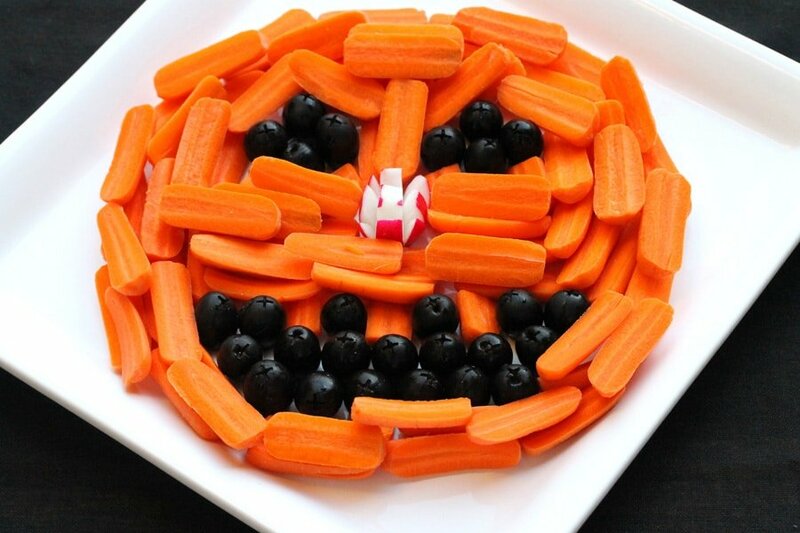 On a flat large plate or platter, form the outline of the pumpkin with the carrots (round side down). 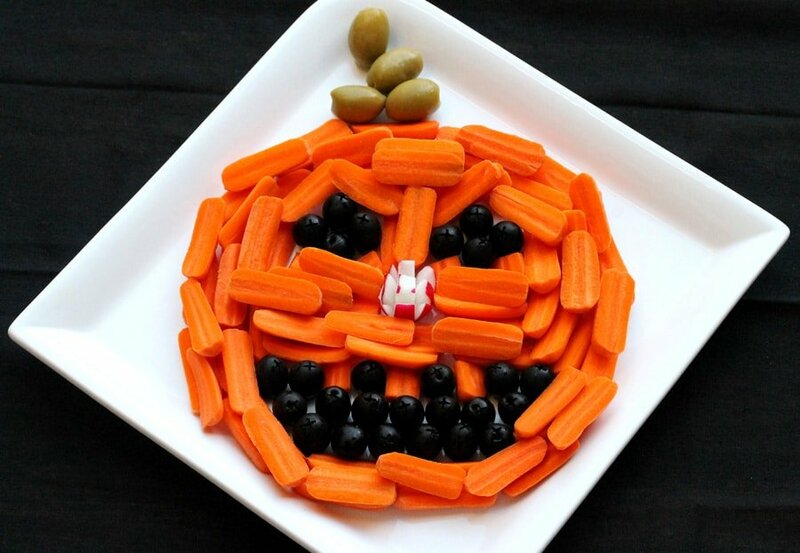 Then make the smile for the pumpkin by using about 10 black olives for the “bottom lip” of the smile. For the “inside” of the smile, add about 5 black olives. 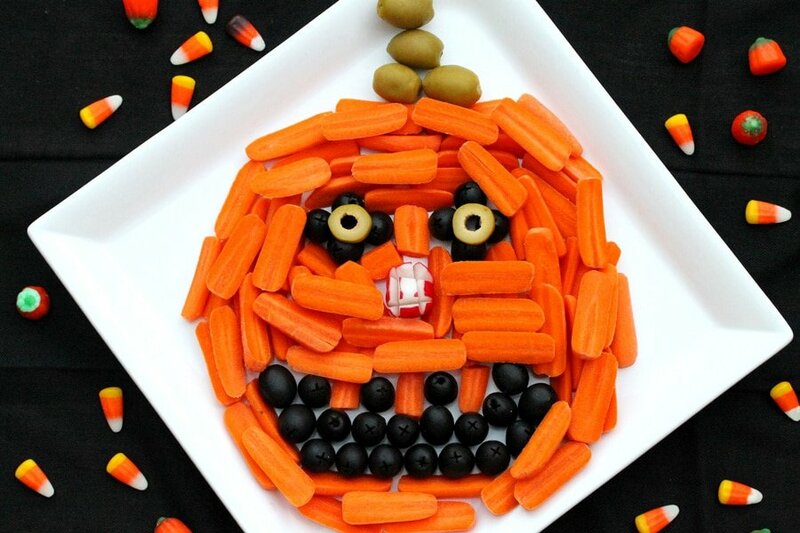 Lastly, for the “top lip” of the smile, use 4 more black olives and leave spaces on each side of the two olives in the middle for the pumpkin’s “teeth”. 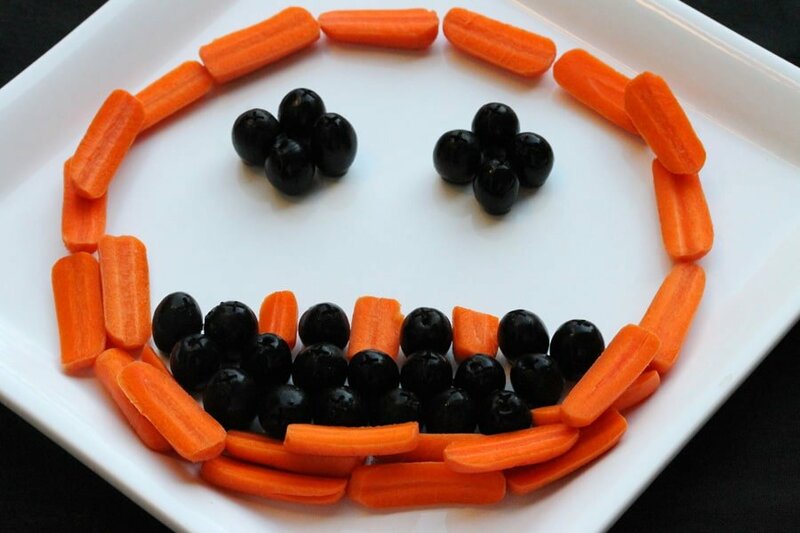 For the teeth, cut a couple of the carrots in half and lay them inbetween the black olives forming the “top lip”. Next, for each eye, use 4 black olives to make a diamond shape. Add the radish to make the nose. 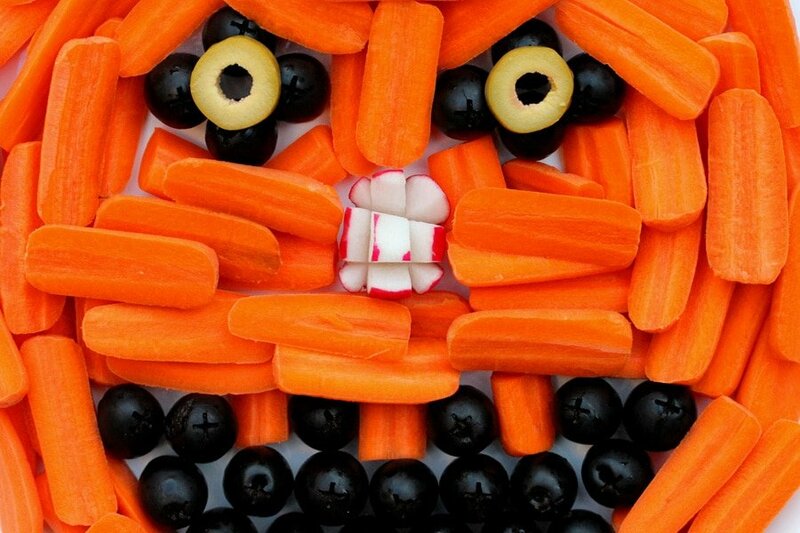 Fill in the rest of the face with the remaining carrots. To make the stem, lay two green olives along the top edge at the top of the pumpkin. Top with two more green olives. Lastly, for the eyes, cut the remaining green olive in about ½ inch slices. Remove the pimento and lay one slice over each of the diamond shaped black olive eyes. 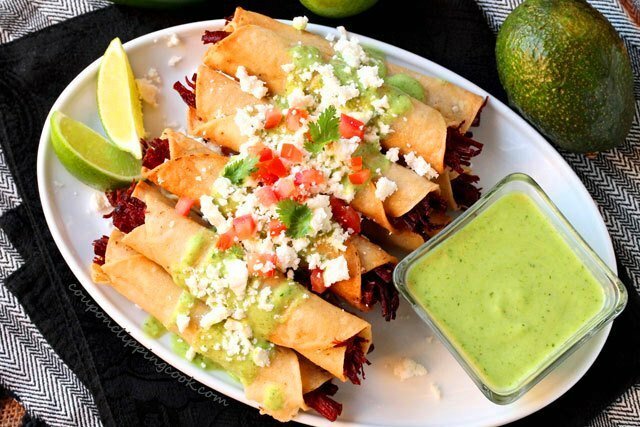 Serve with your favorite dip. 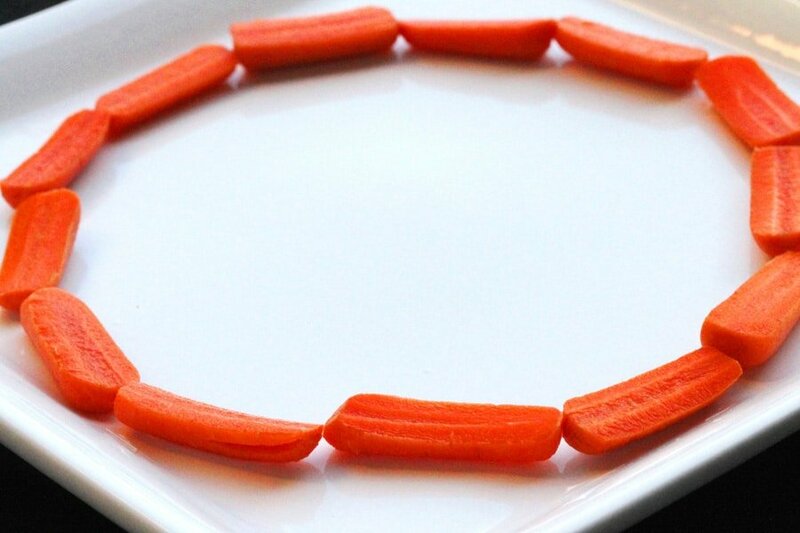 A fun way to serve vegetables. 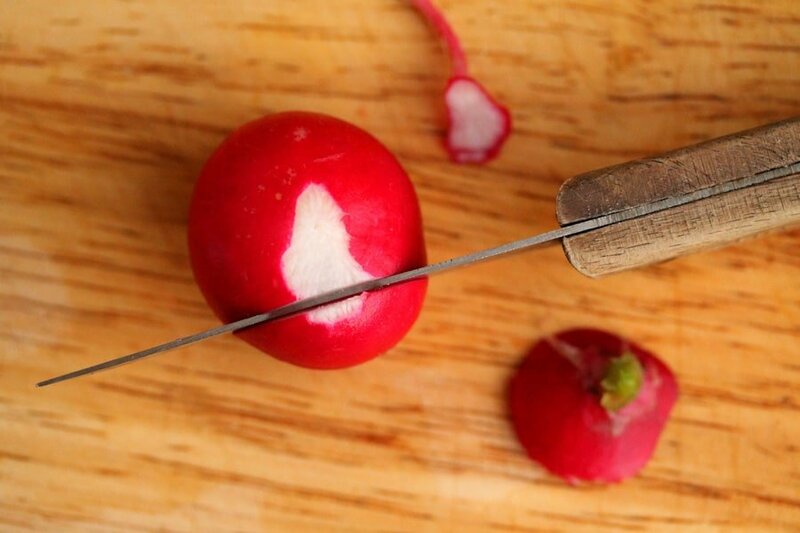 For the Radish Rosette - Make a radish rosette by first cutting off the stem and the tip of the radish. 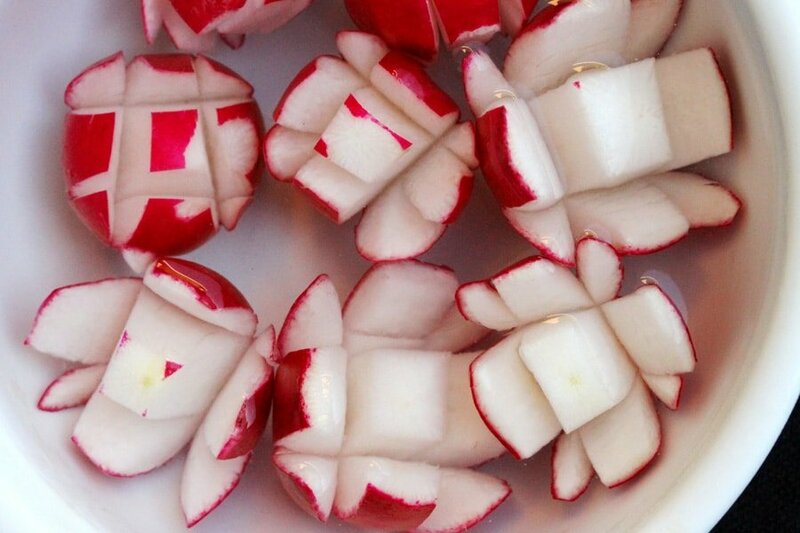 Looking at the radish from top to bottom, imagine that it is a square with 4 sides. 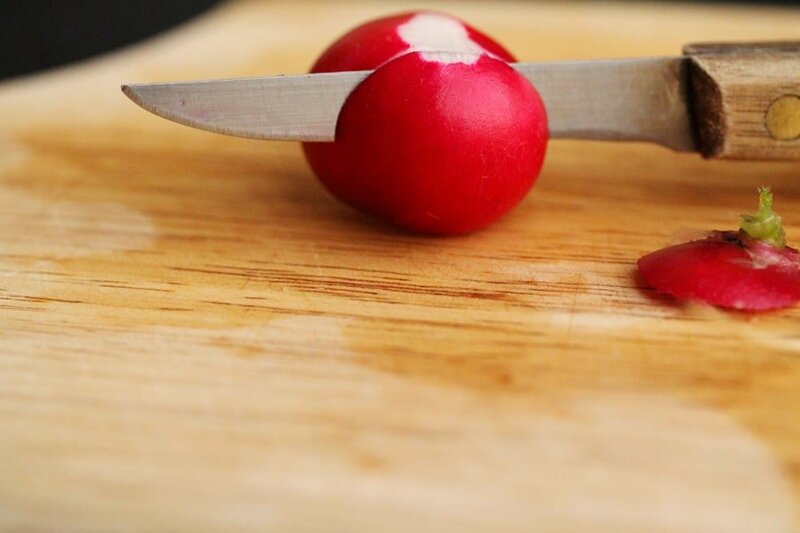 Then with a small knife, make a cut down one side of the radish that is about half way down to the bottom of the radish. 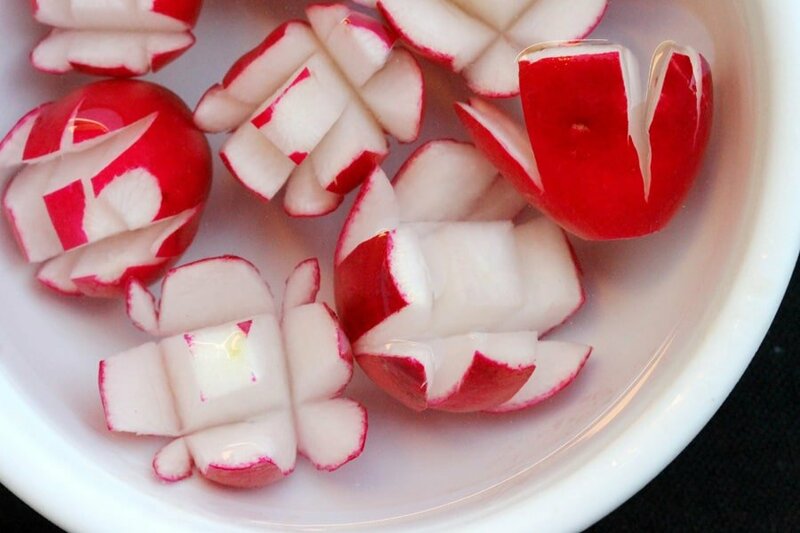 Don’t cut the radish all of the way down to the bottom. Next, on the other side of the radish make another cut that is about half way down, making sure not to cut the radish all of the way down. Then repeat by making the same type of cuts down the other two sides. 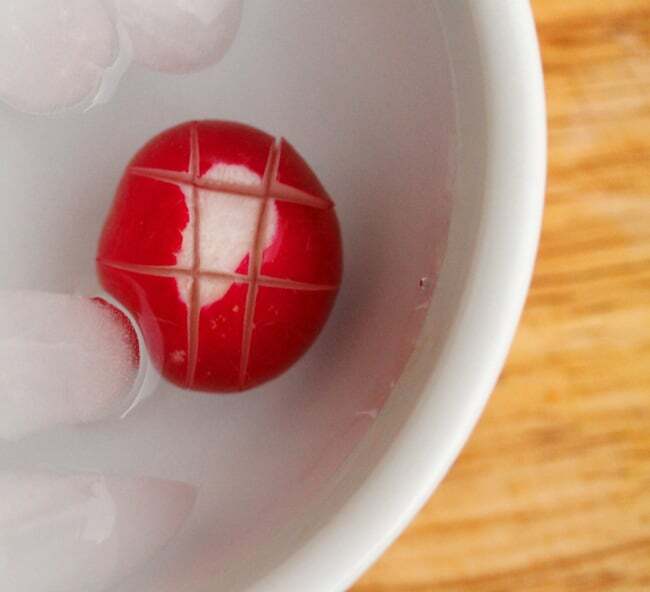 To a small bowl filled with ice water, add the radish rosette so it will open. Let sit in the refrigerator for about 20 minutes or until the radish opens up like a flower. 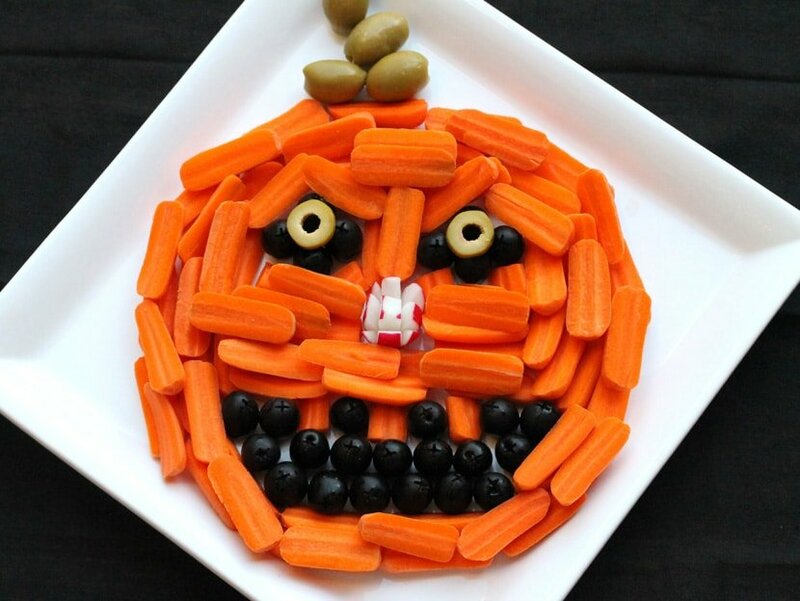 For the Relish Tray - On a large flat plate or platter, form the outline of the pumpkin with the carrots (round side down). 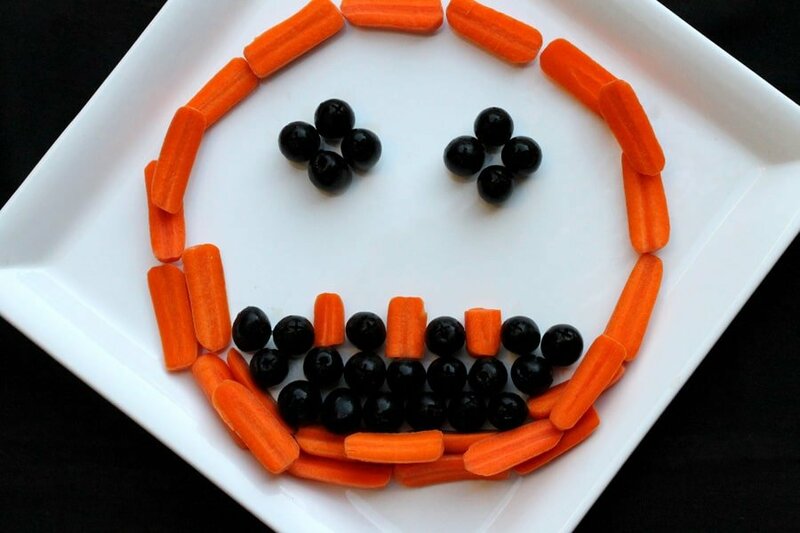 For the Smile - Make a smile for the pumpkin by using about 10 black olives for the “bottom lip” of the smile. 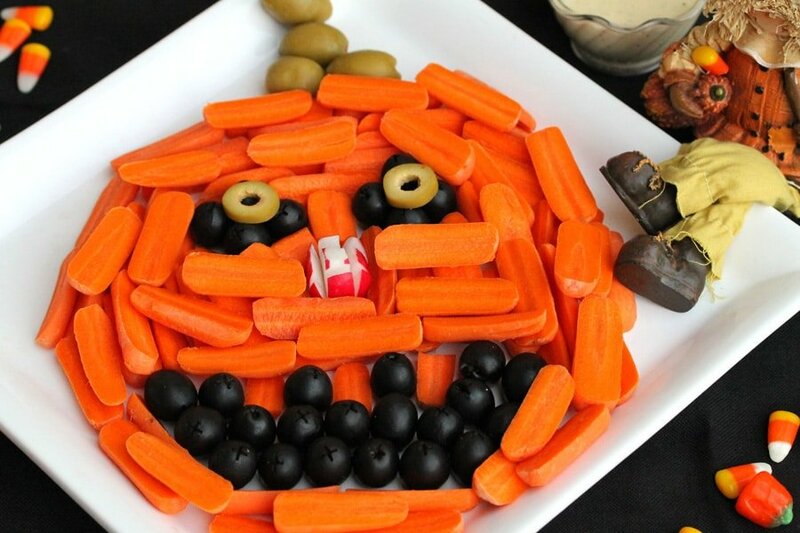 For the “inside” of the smile, add about 5 black olives. 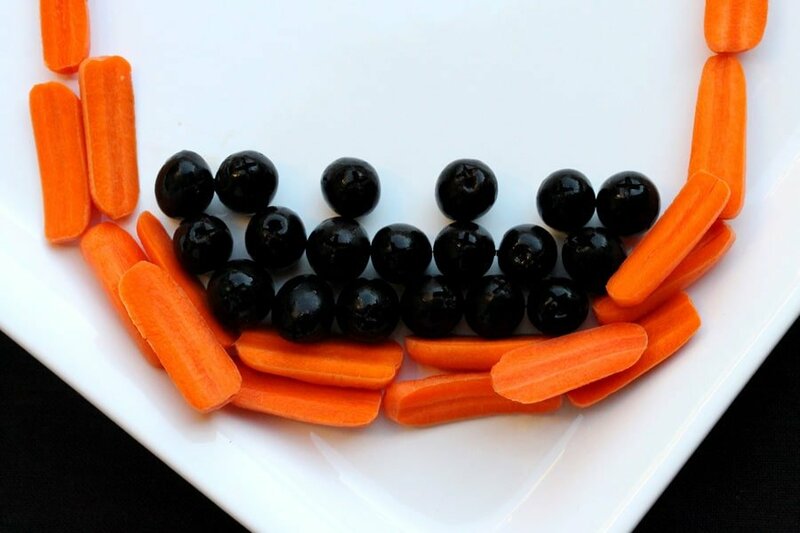 For the Teeth - cut a couple of the carrots in half and lay them in between the black olives forming the "top lip". For the Nose - Add the radish rosette to make the nose. 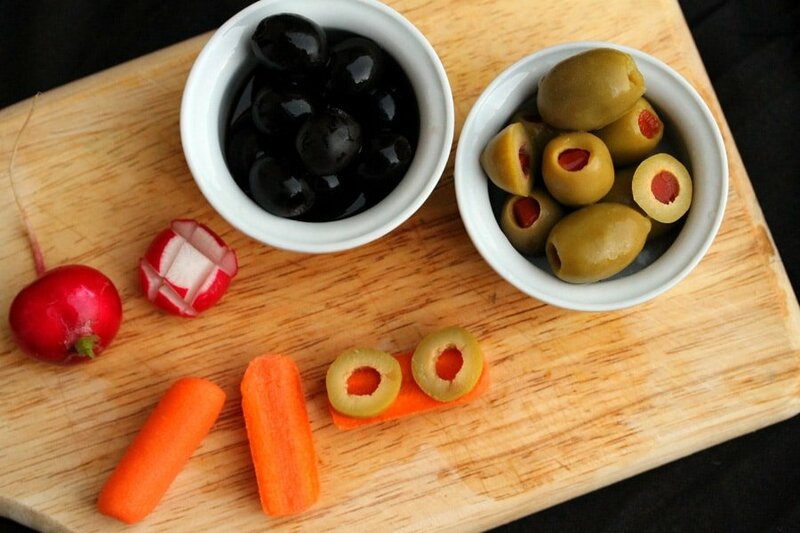 For the Eyes and Face - For each eye, use 4 black olives to make a diamond shape. 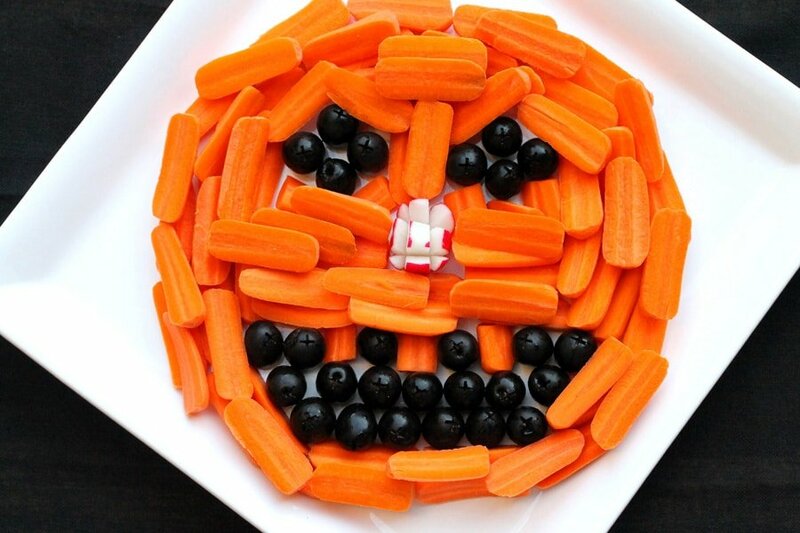 Fill in the face with the rest of the carrots. For the Stem - To make the stem, lay two green olives along the top edge at the top of the pumpkin. Top with two more green olives. For the Eyeballs - Cut the remaining green olive in about ½ inch slices. Remove the pimento and lay one slice over each of the diamond shaped black olive eyes. I love this idea. 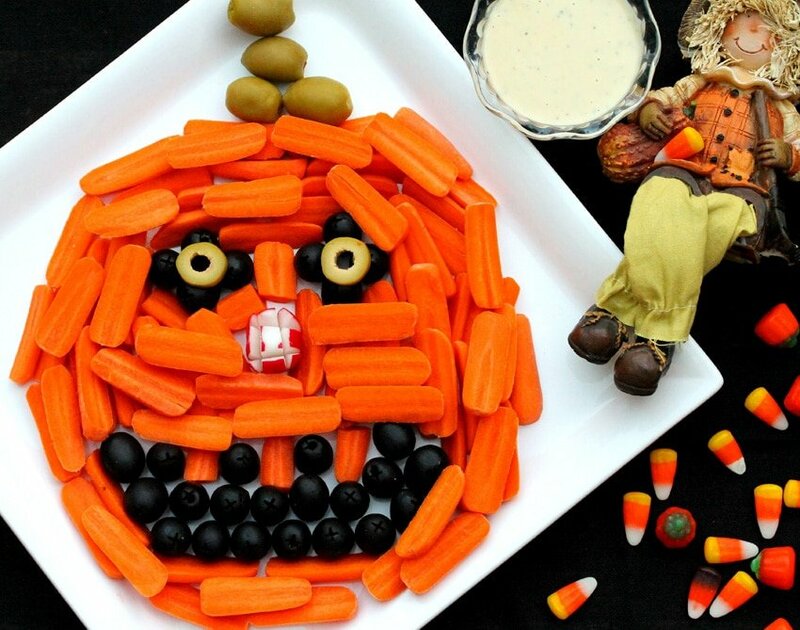 The kids will really get a kick out of the pumpkin shaped face while eating their veges. Thanks for sharing. HI Jackie, thank you for stopping by. Have a great rest of the weekend. I love this idea! So fun! My daughter would love this! Hi Lauren, so glad you liked it. 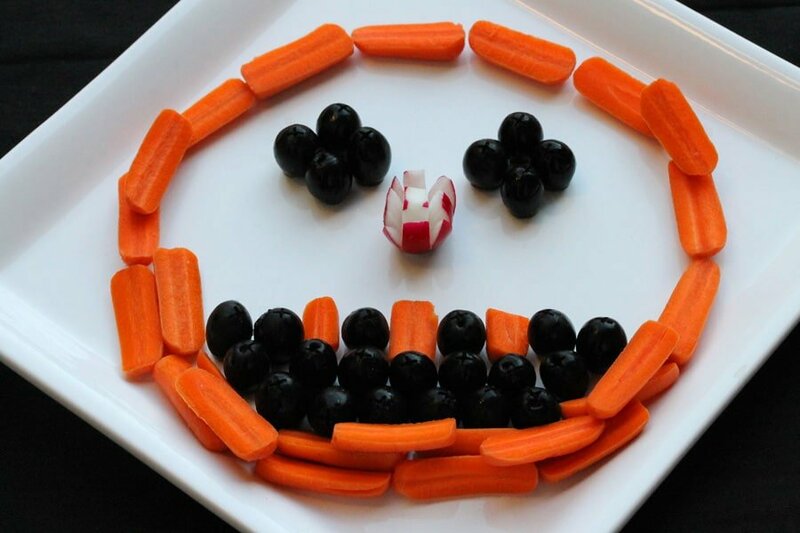 It’s a lot of fun for kids to make…and a great snack for them too! Hi Natalie, thank you very much. Love it! 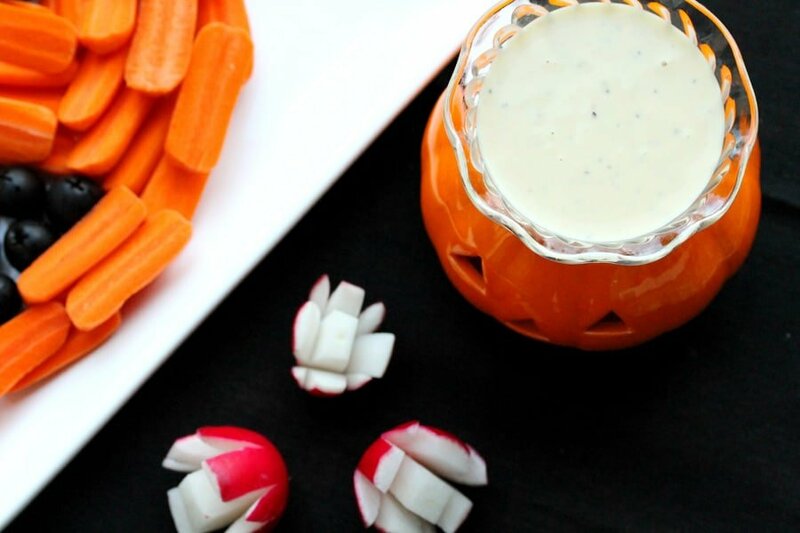 I am a sucker for cute, seasonal food. I’m just a big kid at heart, I guess! Hi Lindsay, me too! I love fun things like this during the holidays. Amazingly simple and fun!! The handy tips about carrots and radish were really good 🙂 Loved your post!